It’s as American as fast foods, ice cream, and candy bars. So why are people saying all those nasty things about soft drinks? The answer is simple: All those terrible things are true. And while the facts may be hard to swallow, it is high time we look at the damage that has been done by our long-running love affair with the beverage industry. 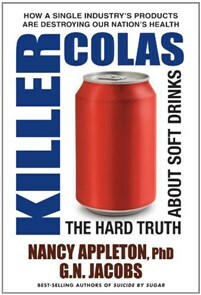 In their new book, Killer Colas, Dr. Nancy Appleton and G.N. Jacobs provide a startling picture of a greedy industry hell-bent on destroying our country’s health, no matter what the cost. Over the last twenty-five years, the sale of sodas, energy beverages, and sports drinks has exploded, as has the incidence of adult and childhood obesity, diabetes, hypertension, heart disease, cancer, and stroke. In Killer Colas, the authors detail why this downward spiral has occurred. They look at the history and growth of the soft drink industry from fountain shops to multinational mega-corporations; they examine the industry’s powerful influence over the media; and they look at the addictive and harmful ingredients these companies have added to their formulas. The authors also offer scientific evidence that links our growing consumption of soft drinks with our declining health. In the light of our country’s health crisis, the consequences of our addiction to soft drinks can no longer be ignored. Killer Colas exposes the facts behind an addiction that is just as powerful and dangerous as our love of tobacco. Once you have read this book, you will never look at a soft drink in the same way. earned her BS in clinical nutrition from UCLA and her PhD in health services from Walden University. She maintains a private practice in Santa Monica, California. An avid researcher, Dr. Appleton lectures throughout the world, and has appeared on numerous television and radio shows. She is the best-selling author of Suicide by Sugar and Healthy Bones. G.N. Jacobs is a general reporter and filmmaker, with features, shorts, and documentaries to his credit. Mr. Jacobs runs the online literary magazine Smoking Lizard. Currently, he lives in Los Angeles, California. Many years ago, I caught my children shaking cans of soda so that they would explode upon opening. I remember yelling at them for wasting the soft drinks. Knowing what I know now about the terrible toll that these beverages can take on your health, I think I should have showered my kids with gifts instead. These days, unfortunately, soda isn’t the only drink that can ruin your health and the health of your children. The industry has branched out, offering numerous products that can get you hooked and lead to illness, including sports drinks, energy drinks, iced teas, and enhanced waters. Temptation is everywhere and comes in many different bottles and cans. Killer Colas is designed to help you resist temptation by providing you with the hard facts about soda and other sweetened beverages. The book begins by explaining how important internal balance is to your health and how food items such as soda throw your body out of balance, leading to frailty and disease over time. It then provides a brief history of the soft drink industry, illustrating how soda became such a fixture in modern society, from its humble origins in pharmacies around the country to its transformation into one of the largest commercial enterprises in the world. Once you understand the big picture, you’ll read about the dirty details of soft drinks and other sweetened beverages. Chapter 3 will tell you exactly what you are putting into your body when drinking these products, and Chapter 4 will describe the most common types of beverages in which these troublesome ingredients are found. From there, it’s time to learn about the many links between sweetened drinks and the numerous deadly diseases and health conditions that have been plaguing society in recent years. With connections to health problems such as asthma, allergies, heart disease, and even cancer, the goods sold by soda corporations may cost you far more than the change in your pocket. Sadly, even when you realize the dangers of these products, they can be much harder to quit than you’d think. In fact, soft drinks can result in addiction in much the same way that alcohol and some illegal street drugs do, as outlined in Chapter 6. In addition to this obstacle, the soft drink industry markets its drinks on a massive scale, making temptation very hard to avoid. Whether they are straightforward or a little sneaky, advertisements for sweetened beverages are virtually inescapable, as you will learn in Chapter 7. Thankfully, Killer Colas is here to help. While soda consumption can be a habit that seems almost impossible to break, there are ways to get the monkey off your back, all of which you will read about in Chapter 8. Although the first step in this journey is yours alone to take, when your community provides education on the dangers of drinking soda and other sweetened beverages, and various levels of government support policies that promote a healthful diet, the chance of you taking two steps back is much less likely. If we all work together, the benefits that come from quitting soft drinks will be enjoyed not only by the individual but also by society at large. For your own sake and the sake of children everywhere, it is time to make a change. The purpose of this book is to reveal the true cost of consuming soda and other sugary drinks. The following pages expose the scary facts about the many liquid refreshments marketed to the public by soft drink corporations. Whether you drink soft drinks on a regular basis or simply have one occasionally, Killer Colas will make you think twice before ever buying a soda or any type of sweetened beverage again.